If you think you have a pretty good feel for how things are going for real estate in Tallahassee, you might want to study housing permits and prepare to readjust your thinking. 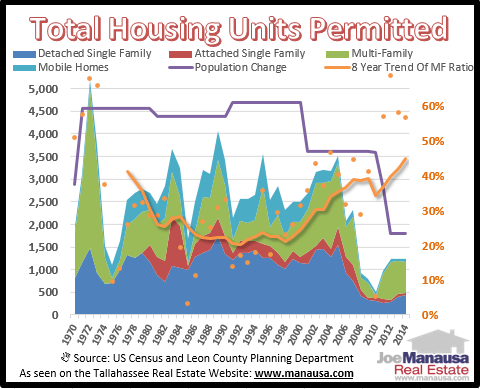 As I was preparing to speak to the Tallahassee Builders Association last week, I studied forty years of population growth trends and compared them to housing unit permit trends over the same period of time. What I found was illuminating. What we are building and where it is being built has been changing significantly over the past ten years, and what you think is "normal" will soon be "how things used to be." The new normal will mean fewer single family detached homes being built, and more multi-family homes (apartments) being brought to the market. In fact, that is the new normal now. In the real estate graph above, we track each type of housing unit permit (detached single family homes, attached single family homes, multi-family and mobile homes) and measure them on the left vertical axis. We also track the population growth (total number of people) each year, shown as a purple line and also measured on the left vertical axis. The orange dots show the ratio of multi-family homes permitted to all permits each year, and the orange line shows the trend of this multi-family ratio (both measured on the right vertical axis). Currently, the ratio of multi-family permits versus all housing unit permits is averaging 45% over the past 8 years, and over 60% for the past four years! This is a huge change from the past. In fact, this is the highest we've seen the multi-family permits in over 45 years, and the trend appears to be moving higher. So what exactly does all of this mean? We are building more apartment units than single family houses. I believe a combination of factors is pushing Tallahassee towards a higher rate of multi-family home construction. First and foremost, this is a national trend that is invading Tallahassee, so what we are experiencing is not simply unique to our area. The national homeownership rate is on the decline. The Federal government has been pushing and supporting a higher homeownership rate for many years, but the housing collapse is causing both public and private entities to reconsider loan programs which proved to have too high of default rates. Student housing investors used to be small, local investors. Now, we are seeing institutional investors get active in student housing (student rentals are moving from Main Street to Wall Street). This means that deep pockets are building lots of multi-family properties with an eye on the long-run and the ability to manage short term losses. That is not usually the case with the majority of local investors. Land costs (meaning the cost to buy and develop land and then bring it to the market) is soaring, so there is a huge disconnect between what the market wants (median home price is $151,000) and what builders can deliver (mean new construction price is $293,000). It won't be long until the average developed lot costs as much as today's median home price. It only makes sense for builders to transition to multi-family in order to get the most housing units per property. As Multi-family student rentals come online, they will be "stealing" tenants from single family homes, condominiums, and townhouses. This means that those units will have a hard time finding tenants with rents high enough to cover expenses, thus many of these units will switch from the "for rent" market to the "for sale" market. This will have an immediate impact on the (im)balance between supply and demand for homes, which in turn, will cause a change in the pattern of home sales in Tallahassee. Currently, 51% of home sales are in NE Tallahassee, and 28% are in NW Tallahassee. I expect the Northwest quadrant to begin pulling the lower-end and median level buyers away from the Northeast quadrant. Over the next ten years, expect to see NE Tallahassee retain far fewer than 50% of the market activity. First time homebuyers and young families will be heading west. The ratio of owners to renters will continue to decline as thirty years of growth in the homeownership rate are replaced with a mortgage market that will no longer condone high levels of default, and a real estate market producing multi-family units at levels affordable to more of Tallahassee's population. One sure-fire way to reverse current trends in both housing and population growth is to change the economic footprint in Tallahassee. We are so reliant on State Government, Federal Government, and higher education that our fortunes are completely tied to the fortunes of public entities. We need to balance our economy with private sector jobs. While the is not news to anybody paying attention for the past 20 years, it is being felt stronger today due to cuts in the State Government. Florida appears to be flourishing with these changes, but Tallahassee was where much of the cuts were made. Local leadership needs to bring jobs to Tallahassee. Period. And we all need to do our part in both demanding and assisting in that effort.